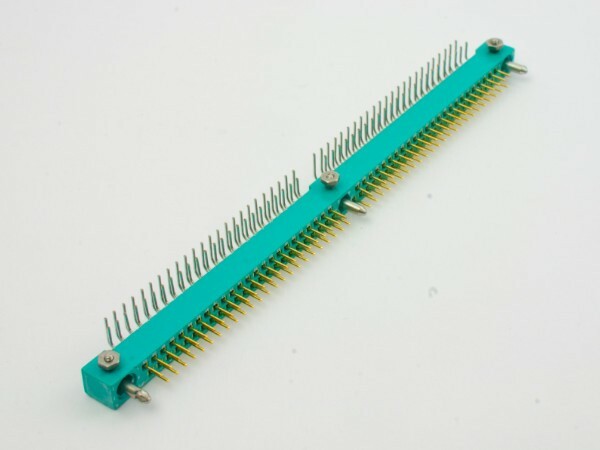 The 2 row, signal or mixed-layout HE801 two part printed circuit board connector system utilises a 1.27mm(0.05in.) staggered pitch with 2.54mm(0.1in.) between rows and were designed to meet the severest of environmental technical requirements in ground and air applications. The 2 row, signal or combination HE801 two part printed circuit board connector system utilises a 1.27mm(0.05in.) staggered pitch with 2.54mm(0.1in.) between rows. Designed to meet the severest of environmental technical requirements from fast jets to gun turrets they have featured on such military programmes as the A300/320, Ariane, Exocet, Ptarmigan, Rapier and also on railway rolling stock applications, where high resistance to abrasion and extreme reliability are critical. Low and high frequency contacts. All contacts removable and replaceable. Low and high power contacts. Power contacts provide up to 25A and coax inserts available for frequencies up to 2GHz. 19 mould sizes up to 96 way l.f. and either 53 + 3 or 41 + 6 l.f./h.f. BS 9525 – N0001 lss.2. Approvals include additional random vibration with superimposed gunfire with interrupts less than 2 nanoseconds. Listed in the MUAHAG (Cenelec) Preferred Parts List (PPL). Wide range of termination styles and comprehensive choice of jacking and polarising. Polarising facilities l.f. 36 position h.f. 36 or 16 positions. Jacking facilities, including 1/4 turn locks. Coaxial inner 12mΩ max. outer 6mΩ max. High Power 5N max. 1N min. Contact Holding Force 0.15N min. No intermittencies measured when using an H.S.L.I. Detector with trip threshold of 2 ns. Available for both male and female covering PCBs of 1.6, 2.4 and 3.2mm thickness there is a choice of straight and 90 degree p.c., solder for wire, crimp (22-26 AWG) and wire wrapping. High power contacts are available with solder bucket, straight and 90 degree p.c. Crosses may be available to Hypertac, ATI and Amphenol Socapex series 127 connectors. Designed to meet the severest of environmental technical requirements from fast jets to gun turrets they have featured on such military programmes as the A300/320, Ariane, Exocet, Ptarmigan, Rapier and also on railway rolling stock applications, where high resistance to abrasion and extreme reliability are critical. The l.f./audio connectors are available in 9 sizes from 17 to 96 ways. The mixed layout styles provide the addition of 3 or 6 cavities capable of accepting either coaxial or high power inserts in 10 sizes from 5 + 3 to 53 + 3 combinations.